Take control of your pain--naturally! Living with pain is a daily struggle. If you are suffering from chronic pain, sometimes even small tasks can be difficult to accomplish. But there is hope. 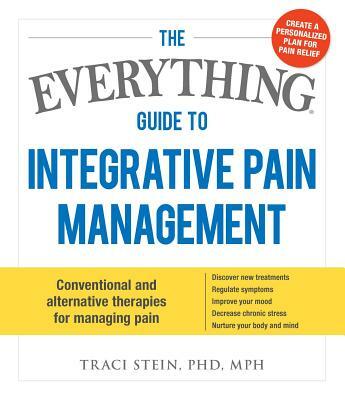 With The Everything Guide to Integrative Pain Management, you'll learn about the different options for managing pain with an integrative plan, incorporating traditional medications with natural pain relief solutions. With advice on which treatments are best for specific types of pain, as well as guided breathing and relaxation exercises to ease body stress, this all-in-one guide gives you the tools you need to manage your pain and get back to living. Traci Stein, PhD, MPH, is a clinical supervisor and adjunct professor at Teachers College, Columbia University. She is the Complementary and Alternative Medicine Topic Expert at GoodTherapy.org and a PsychologyToday.com expert on integrative medicine. She has served as the Director of Integrative Medicine in the Department of Surgery at Columbia University Medical Center, where she worked with Dr. Mehmet Oz to develop and manage studies examining the possible benefits of complementary and alternative medical therapies. Visit her website at www.drtracistein.com. She lives in New York, NY.